I decided on the Basil Beef Bowl with Quinoa Stir-Fry, and the Roasted Lamb with Agrodolce Pearl Onions and Mashed Potatoes. 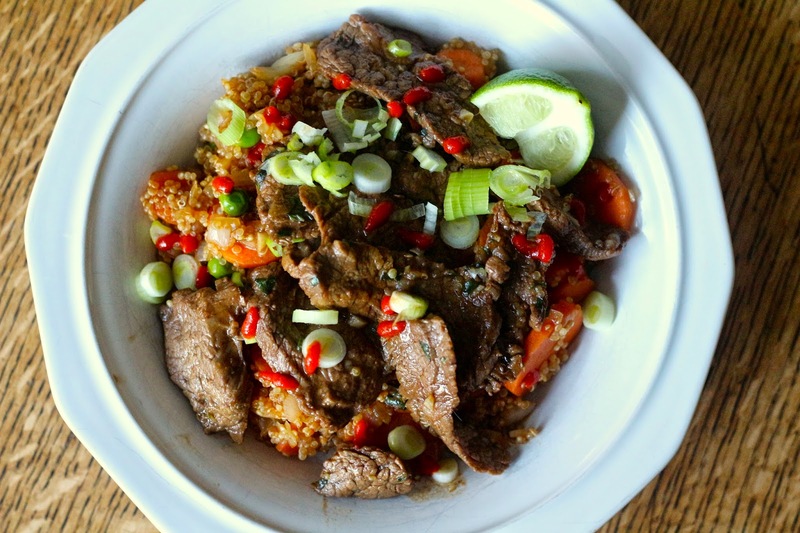 This is the Basil Beef Bowl with Quinoa Stir-Fry, and it was very good! I never would have considered quinoa used in an Asian inspired dish, but it works! You can see I added more Sriracha because I like my food spicy! And the Roasted Lamb with Agrodolce Pearl Onions and Mashed Potatoes...I am going to admit defeat, I forgot to take a photo. I haven't done that it a while, so I guess I was due. It was our Easter dinner, and it was good. Some Plated dishes can be shared between three people even when they are only supposed to serve 2, but this wasn't really one of them. I had to also make a salad for it so we had enough. It was OK, not my favorite, and I think the recipe needed some work. Not all of the steps were included, I had a problem with there being too much rosemary that coated the lamb and just made it taste woody. The mashed potatoes should have been mashed with butter, which is what I did, but not what the recipe called for. Overall, this was a pretty good delivery, I think I would definitely make the Beef dish again!